Julia Day’s new novel, FADE TO US, features a teen with Aspergers—and Julia’s own daughter served as her sensitivity reader. Julia says, “Although the book has a sweet romance, it’s mostly about two stepsisters—new to each other—learning how to love each other when one of them has a developmental disability. I’m an autism mom. 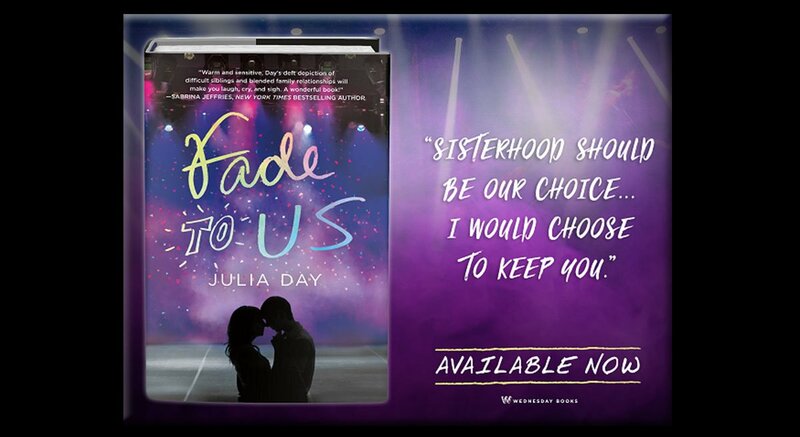 I worked closely with my daughter to get the autistic character right—without it being a fictional version of her.” In honor of Autism Awareness Month, here’s Julia, giving us the inside scoop on FADE TO US. Welcome to the blog, Julia! Your newest novel, FADE TO US, came out in February . . . though we’re just chatting about it now. What’s the book all about, and what inspired you to write it? The original concept for FADE TO US was a summer teen romance set during a musical theater camp. I came up quickly with the two heroes, Micah and Brooke, and I knew they wouldn’t be actors. Then my younger daughter encouraged me to include an autistic character. It surprised me, because she’s always been private about her autism. If I wrote an autistic character, we couldn’t be quiet anymore. But Amelia assured me it was okay, so I added Natalie, a teen with Aspergers, who finds herself suddenly living for the summer with her new stepfamily after her father remarries. Told from Brooke’s POV, this book is about all kinds of relationships. The friendship that builds between Natalie and Micah. The bonds that form in a blended family. The minefield of the romance between Brooke and Micah, her stepsister’s friend and mentor. But most of all, readers witness sisterhood, in all its sweetness and complexity. April is Autism Awareness Month, which is a perfect tie-in to FADE TO US. When you and I spoke about the novel, you said, “Although the book has a sweet romance, it’s mostly about two stepsisters—new to each other—learning how to love each other when one of them has a developmental disability. I’m an autism mom. I worked closely with my daughter to get the autistic character right—without it being a fictional version of her.” Tell us some more about this process—how did you involve your daughter, and how did she feel about helping to shape your novel? Was it hard to write an autistic character that wasn’t your daughter’s clone? My daughter’s very first comment was “Natalie likes dogs.” I put that in intentionally. Since Amelia is a cat person, making Natalie a dog-lover was a message to us both that they were not clones. I added other details, too. Their physical appearances are different. Natalie likes science, and Amelia likes the humanities. With these traits clear in my mind, it allowed me to relax about Natalie being her own unique character. You also have two magical realism YA series published under your pseudonym, Elizabeth Langston. Why did you choose to write under a pseudonym, and do you have any challenges balancing your dual identities? The Elizabeth Langston books came first. When St Martin’s Press signed me to a contract, it was their request for me to publish under a new pen name. There are challenges. I have 2 websites, 2 twitter accounts, and 2 FB pages. I have two fan bases. Although they have some overlap, there is enough separation that I often create different content for social media or in newsletters. However, two identities can be good, because it makes my brands clear. With an Elizabeth Langston book, readers expect magical elements and more emphasis on the external conflict. A Julia Day book will be a realistic, contemporary romance. Like me, you live in North Carolina—though you were born in Tennessee and raised in Mississippi. How does your identity as a southern author find its way into your work, and what is your favorite element of North Carolina’s literary community? The American South has a history filled with strife, such as the Civil War, the Trail of Tears, or modern racial tension. We’re still struggling, yet we’re also the least segregated part of the US. We do things right, we do things wrong, and we strive to get better. That willingness to acknowledge mistakes and forgive ourselves so we can move on and make progress is a theme in a lot of Southern fiction, including mine. My husband and daughters are native North Carolinians. I love my adopted state and its diverse people, history, and geography. That’s also my favorite element of our literary community—its diversity. As far back as its colonial (provincial) days, North Carolina has had its own distinctive way of being. 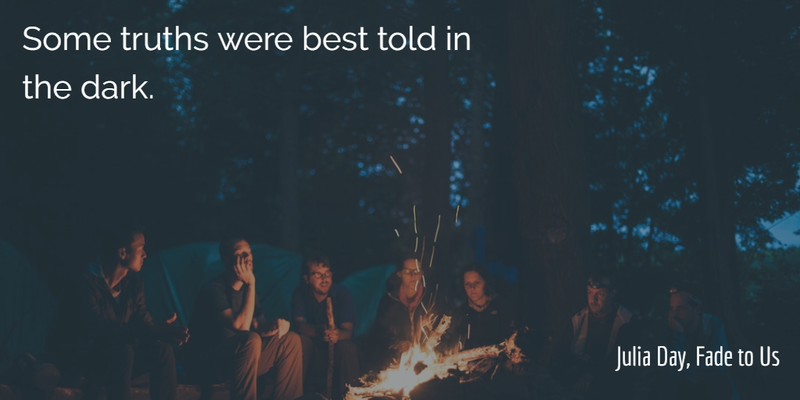 NC authors reflect that in our stories. What was the most challenging part of writing FADE TO US? The most surprising? And what do you hope readers take away from the book? It was most challenging to write candidly about how delightful and tough it can be for a family with a disabled child. Natalie is smart, insightful, and self-aware—but she’s also moody and anxious. It’s more enjoyable to create the happy scenes, but it wouldn’t have been honest to stop there. I had to write the bad stuff, too. Writing Natalie’s meltdown was hard to get through. I still tear up when I read it. Most surprising? The reaction to the sacrifices Brooke makes for Natalie. Many reviewers resented (on Brooke’s behalf) when she puts her goals on hold to give Natalie a happy summer. That shocked me. Growing up, I had siblings with disabilities. No one asked me to sacrifice for them, but I did. My older daughter often chooses to smooth her autistic sister’s life. Like my older daughter, Brooke sometimes fumbles her efforts to put her sister’s happiness first, but she always recovers. I’m surprised by how many readers think those sacrifices were a problem. There are two things that I hope readers will take away from the book. 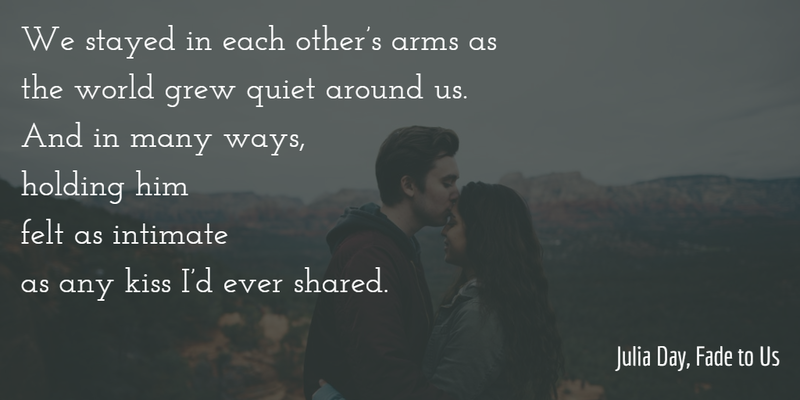 First, relationships are seriously hard. You can have the best intentions, throw your whole heart into being the ideal daughter/ friend/ sister/ partner—and still get it wrong. There’s no way to mistake-proof relationships. So, forgive the people you love when they mess up. And forgive yourself when you do, too. Secondly, autistics are more than their disability. They have fears, hopes, and gifts. They like to laugh and talk. They can be grumpy, fun, aloof, and friendly. Their personalities are influenced by many things: their age, background, education, families, interests—and their disability. Autism is only one part of who they are. Brooke’s summer is going to be EPIC— having fun with her friends and a job that lets her buy a car. Then her new stepfather announces his daughter is moving in. Brooke has always longed for a sibling, so she’s excited about spending more time with her stepsister. But she worries, too. Natalie has Asperger’s–and Brooke’s not sure how to be the big sister that Natalie needs. 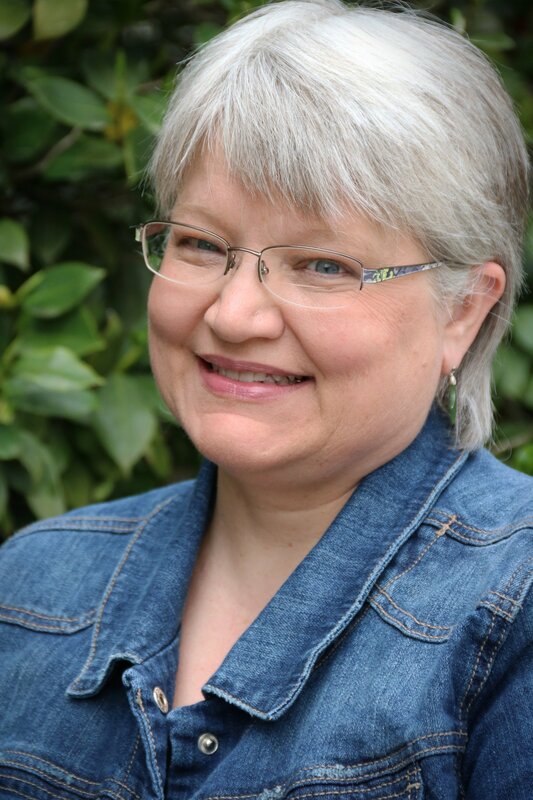 Julia Day is an award-winning author of Young Adult fiction. She lives in North Carolina, USA, halfway between the beaches and the mountains. Julia has two twenty-something daughters, one old husband, and too many computers to count. When she’s not writing stories or software, she’s traveling to faraway places, watching TV shows about British royalty, or exercising with little enthusiasm. Julia also writes YA magical realism as Elizabeth Langston.